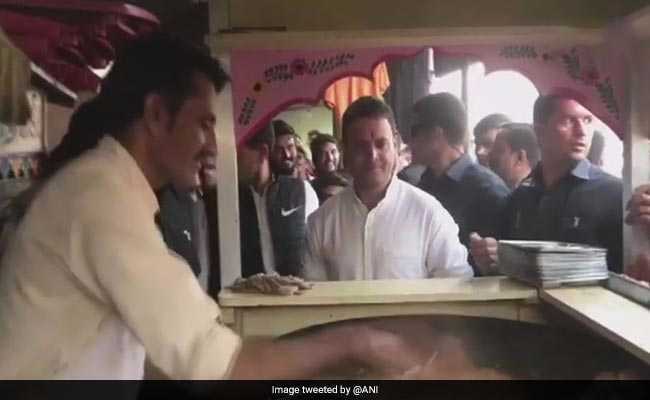 In a video that has been tweeted by news agency ANI, Rahul Gandhi is seen waiting patiently at a stall, smiling, while the bhaji is being freshly prepared on the hot pan. New Delhi: Beginning the phase 2 of the Congress' campaign in Gujarat, its president-to-be Rahul Gandhi addressed multiple rallies this afternoon in the state. So, as he arrived in Tarapur, the 47-year-old decided to take a small break for a quick bite, and was spotted at a local pav bhaji stall. In a video that has been tweeted by news agency ANI, Mr Gandhi is seen waiting patiently at the stall, smiling, while the bhaji is being freshly prepared on the hot pan. He can be seen rolling up his sleeves in anticipation while surrounded by dozens of supporters. 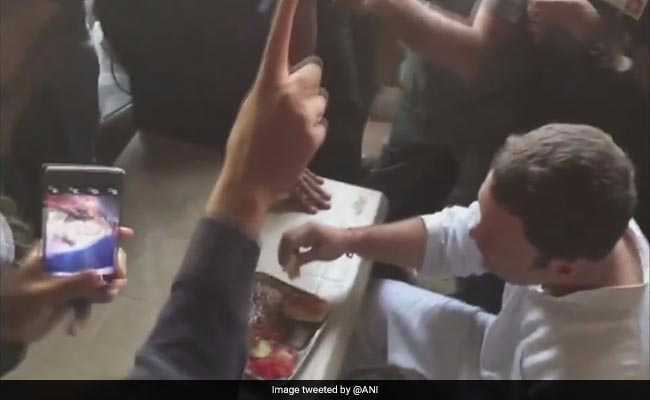 As he waits for his pav bhaji to be ready, Rahul Gandhi shakes hands with a couple of people gathered around the stall; many can be seen shooting videos and taking photos from their cellphones of this rare visit. Rahul Gandhi can be seen rolling up his sleeves in anticipation while surrounded by dozens of supporters. The video ends with the Congress president-designate sitting on a table, enjoying his hot meal, still surrounded by many people clicking photos. Mr Gandhi's Congress is engaged in an uphill battle in Gujarat where it hopes to dismantle the 22-year-long BJP reign. Ahead of the 2019 national election, Mr Gandhi hopes to begin reversing the trend of his party losing state elections with Gujarat. Voting will be held for 89 of the state's 182 assembly seats in Saurashtra and south Gujarat tomorrow. The second phase of polling will take place on December 14 and votes will be counted on December 18.